We would provide a link for you to host on your website. via your website or in email/newsletter correspondence. 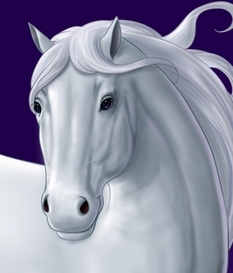 We can change the photo or message here to suit your preferences. The first of The Happy Angels! positive and fresh series, this vibrant handbook shares divine new messages linking today's young minds with the power of the universe. Expressed through positive energy, daily situations, happy faces and diverse backgrounds, Think It UP handbook answers the curiosities that are empowering lives and energy in all. Think It UP! uniquely meets children "where they are!" They impact their powerful abilities to "Shine the Light" in any situation and to create great change for the futures of humanity and the earth. This enlightening handbook shows children "how to" focus on love, where their kind thoughts and choices magically bring divine opportunities, ideas and solutions into their lives each day. CLICK THE IMAGE TO PREVIEW THE Think iT UP! Handbook geared for TODAY'S GIRL! So fun and comfortably relatable, "Think It UP!" speaks one on one to each child. It shares simplistic ways to overcome daily obstacles. limits, doubts and fears! It inspires children to take time out of their day to love who themselves, one another and the spirit of "I AM" within! Think It UP! brings with it a wonderful solution that is on board with positive and effective change in the world! It ignites divine laughter, joy and the special gifts from within. It shows today's youth "how to" fulfill their important dreams and goals and to create lives they will absolutely love living! Each Handbook includes 150 vibrant high quality pages and Positive "I AM" bookmark! "Think It UP! 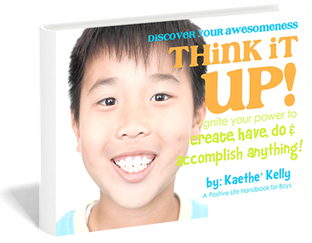 Discover Your Awesomeness" shares the same great new messages as "Think it Up! Shine Your Light." This version is shared through an array of vibrant photos inspired by boys diverse curiosities, backgrounds and daily situations. It is filled with happy vibrations...all relatable, silly, serious, compassionate and fun! Both boy and girls versions of Think It UP! deliver the same inspiring messages, bringing awareness and meaning to the purpose of every child's life. "Think It UP! Discover Your Awesomeness" helps boys discover and enjoy the uniqueness of who they are inside, the joyful spirit of "I AM" and their relationship with the powerful energy of the universe! CLICK THE IMAGE TO PREVIEW THE THINK IT UP! Handbook geared toward TODAY'S BOYS! 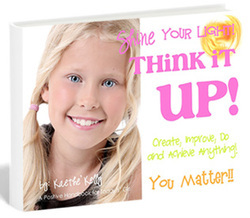 This handbook ignites positive feelings that open their minds and hearts! It helps children begin to master the powerful thoughts and visions that create great changes and make wishes, goals and dream come true.